After my wife's recent promotion at work we decided to do something fancy at home for dinner to celebrate. Due to extreme hunger the first night the fresh oysters and cinnamon swirl bread became our first meal and we saved the main course for the next night. Since swordfish is her favorite fish I decided to do a sous vide swordfish dish with a bunch of vegetables from our garden and the local farmers market. 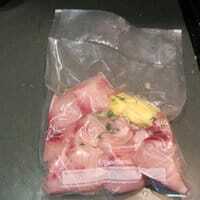 The swordfish was prepared by adding mint, lemon verbena, thyme, salt, pepper, and butter to the sous vide pouch with swordfish "chunks" about 1" x 2" in size. Once we sealed it we cooked it at 132°F (55.5°C) for 20 minutes. It came out meltingly tender and super sweet. We served the swordfish on a bed of yellow wax beans, Fortex green beans, thinly sliced blue potatoes, and roasted red shallot. Then we topped it with fresh Florida mango (hand delivered from our Florida friends), lightly roasted sweet corn, and the butter mixture from the sous vide pouch. 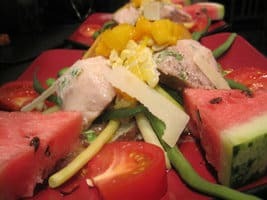 With some fresh heirloom tomatoes, Mexican Gherkin cucumbers, and local watermelon as garnish. 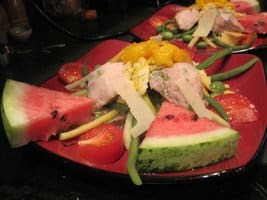 The beans and corn added a nice crunch to the velvety texture of the sous vide swordfish and the tang from the cucumbers and tomato helped offset the sweetness of the mango and swordfish. All in all it was a great dish but the swordfish still managed to be the star. Using sous vide swordfish doesn't have to be such a production though. You could simply serve it with some blanched green beans or a tomato-cucumber salad. If you sous vide the whole swordfish filet you can quickly sear it in a hot pan and serve it with rice or mashed potatoes and a green salad. You could even rub some BBQ sauce on it and throw it on the grill for a minute on each side for a great BBQ swordfish dish. 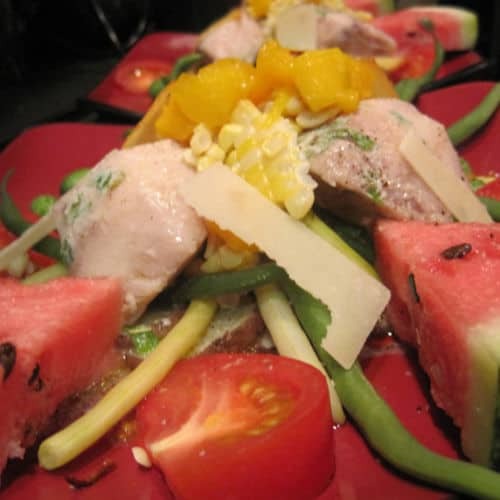 Anyway you serve it, sous vide swordfish is a meltingly tender main ingredient in any dish. 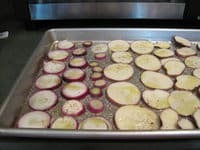 If you would like more information about the modernist techniques, ingredients, and equipment used in the Sous Vide Swordfish you can check out the following. Season the swordfish with the salt and pepper then add to the sous vide pouch. Add the thyme, lemon verbena, mint and butter to the pouch and then seal. Preheat the water bath to 132°F. Place the sous vide swordfish pouch into the water bath for 15 to 30 minutes. Take the swordfish out of the pouch, reserving the butter-herb liquid. If searing, pat dry the swordfish and sear over high-heat in a hot pan or on a hot grill. At that point, simply plate with whatever sides you decided on and serve. I personally love the flavor of the butter-herb liquid so I tend to use it as a sauce and pour some over top of the dish.